Home > Top 10 > The Witcher's Geralt is guesting in Soul Calibur, how's about these five franchises next? The Witcher's Geralt is guesting in Soul Calibur, how's about these five franchises next? The Witcher’s Geralt of Rivia is coming to Soul Calibur 6 later this year. While Soul Calibur has an illustrious history when it comes to franchise crossovers (I got so many ring outs with Link in Soul Calibur 2 on the Gamecube), this is the very first time we’ve seen CD Projekt Red’s White Wolf outside of the universe of his flagship games. With the dirty old letch starting to spread his seed into other franchises, here’s the top five games we want to see the Butcher of Blaviken in next. Yeah, sure, Squidlings are cool and all, but do you know what else is cool? A dude with a sword. Yeah. Smash Bros. is a perfect logical leap for Gerald of Riverina. Regular attacks with your steel sword, special attacks with your silver sword and your magic secret gang signs. They put Snake in it, so just put old leatherpants in it too. And it’s a perfect gateway drug for getting The Witcher 3 on Switch. Koei Tecmo are notorious for letting just about anything into its Warriors games. From Zelda to Fire Emblem to anime Persian historical epics, Koei just seem to shrug and do, like, whatevs. 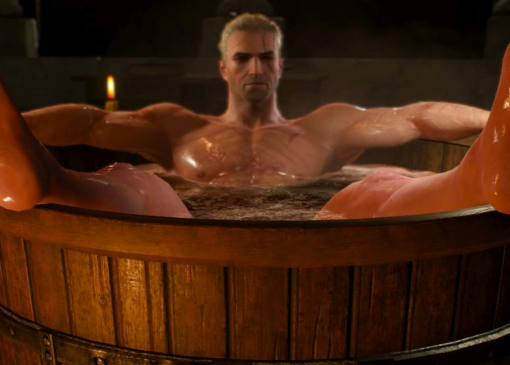 So why not The Witcher Warriors? Picture it now – a huge open battlefield where swarms of Nekkers shuffle obscenely. Cut to our hero Gertrude of Ribena striding into battle sending little impy things flying with flashy weird jumpy moves and stuff. I dunno I’ve never actually played a Warriors game for more than five minutes but it sounds fun and exciting and perfectly open to the exploitation of blatant capitalism. Lego Witcher! Just like craven capitalists Koei Tecmo, Warner Bros. are wont to scavenge absolutely anything and everything for their blocky world building games. Can you imagine the siege of Kaer Morhan, except you have to build Kaer Morhan out of Lego?! The Witcher also has a gently surreal sense of humour on occasion, which Lego seems to take to, so that could work. And imagine how adorable a little Lego Roach would be! Make it happen people! If anime taught me anything, the only thing stronger than a gun is a sword. Or magical love beams. Or kung fu. Okay, lots of things are stronger than guns in anime. But back to the swords thing. Swords are cooler than guns and Godot of Rosencrantz and Guildenstern has two of the suckers. So pit the soldiermens of Call of Duty against (or with) old crotch-rot with his sword and watch their pew pews go poo poo. Okay, this probably wouldn’t work to well, but it could be viable in zombies mode. Besides, Call of Duty is rubbish and it and old Gerbil deserve each other. So there it is. Five game series that would benefit from the addition of Grumbleguts Rudypants. But yeah. Soul Calibur 6 and The Witcher seem like a perfect fit and I’m really looking forward to the marriage of two of my favourite franchises.